Is your family preparing for some beach fun? Do you have everything you need? Apart from the obvious (sunscreen and swimsuits), there’s another essential to remember: toys. We’ve searched and found the best beach toys for kids of all ages. Going to the beach can be a blast. However, the beautiful blue sea isn’t always enough for the younger members of the family, so entertainment is important. Having some toys ready to keep your child occupied might just save the day. Let’s get started. Use the links above to check the latest prices or read our in-depth kids beach toy reviews below. The best beach toys for kids are entertaining and also durable. Let’s go through the things we considered when choosing our top favorites. Since the toy will be spending most of the time on the beach, you might want to consider how it should be cleaned. Toys that can trap water aren’t a good choice since this could lead to mildew or mold if not properly dried out (source). Also, if your kid is similar to mine, those toys will surely end up in the bath later on. Toys that are bad quality are not only a waste of money, they can also cause a fair amount of tantrums if they break. Hard plastic is the way to go. It can withstand salt water, sun, and sand (wet and dry), and it can also endure a little rough housing. When you take your family to the beach, you most likely pack several bags. You need extra clothes, towels, etc. You don’t want the beach toys to be an added burden. Finding a reasonably-sized toy that fits your child’s needs is important. You might also want to stay away from toys that are too heavy. After a long day at the beach, it can be a headache to carry heavy toys and tired children. Babies: Bright colors and chunky, basic toys made out of hard plastic. Toddlers: The classic bucket and shovel could provide endless fun for a toddler. Children: Simple games and activities are what it’s all about. Your child might also be interested in making an amazing sandcastle. Tweens/Teens: Ball games or ways for them to explore the ocean might be a hit. Finding the right beach toy might seem straightforward. However, with the huge variety available, it can become a challenge. 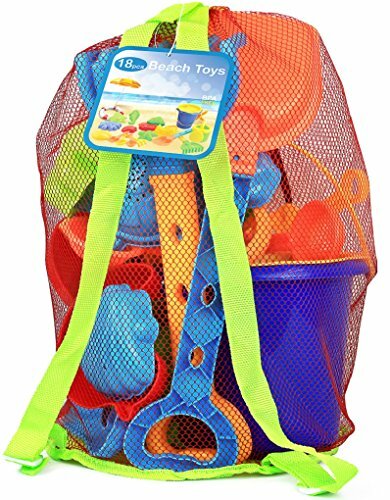 To help you out a little, we’ve done some of the hard work and found the best beach toys for kids. This disk set has lots of fun opportunities. 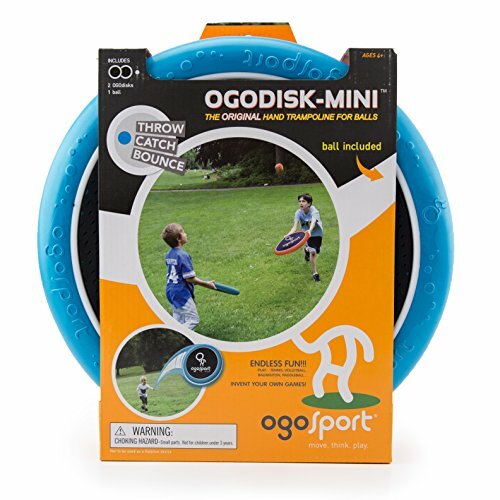 With this pack of two, your child can play using the paddles and the “OgoSoft” ball. They can also be used for activities such as tennis, or even a game of frisbee — anything that involves throwing or bouncing. These disks function like mini trampolines and with the right force, they can shoot items up to 150 feet in the air. They’re suitable for all ages, starting at 4 years old. Made from foam and spandex, the materials are durable yet lightweight, and should dry quickly. Baking cookies on the beach? Why not. These cookie cutters are super cute — shaped like various sea animals, such as a crab and fish. 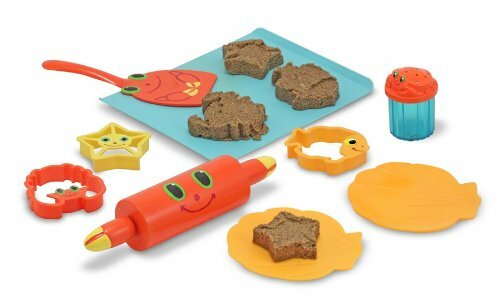 The cookie set is suited to children aged 3 and up. It comes with 11 pieces, including a rolling pin, cookie sheet, spatula, dishes, and even a sprinkle shaker. Your sweetheart will also get a mesh bag for transportation and quick drying when it’s time to go home. Building sandcastles can be frustrating when the outcome looks more like a pile of wet sand than a castle. With these molds, all your kid has to do is fill up the bucket and find the perfect spot for construction. The buckets are great for children aged 2 and up. 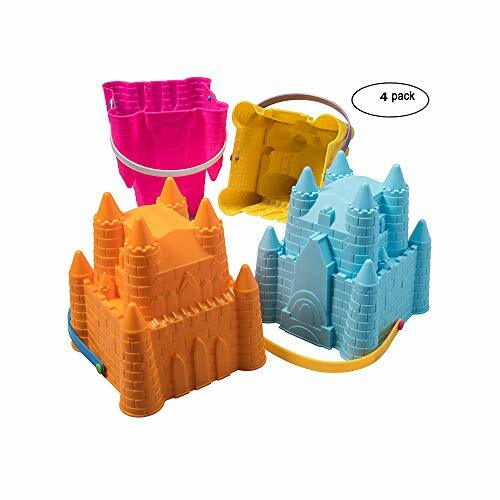 The sandcastle set includes four different buckets with handles, making them easy to carry around. The buckets are made of hard plastic and they can be stacked together for easy storage. This red wagon might just be the ideal beach accessory for kids. It comes with a variety of sand molds, a bucket, a sift, and a shovel. The bucket and molds each have unique patterns to make your child’s sand sculptures stand out. The wagon makes it easy for your kid to transport all their essentials. All items are high-quality and made from BPA-free materials. This multi-functional wagon set is suitable for children aged 18 months and up. When you go to the beach, you must have sand toys — it’s a given. This set includes 18 pieces, including shovels, a bucket, and sand sifters. It also features a variety of cute, ocean-themed sand molds, all in a mesh bag for convenient carrying. The items are made of hard, BPA-free plastic. The bright, vibrant colors are great for lots of creative play for children ages 12 months and over. Let your kids use their imagination to create scrumptious treats while at the beach. The mouthwatering set includes 14 brightly-colored pieces. 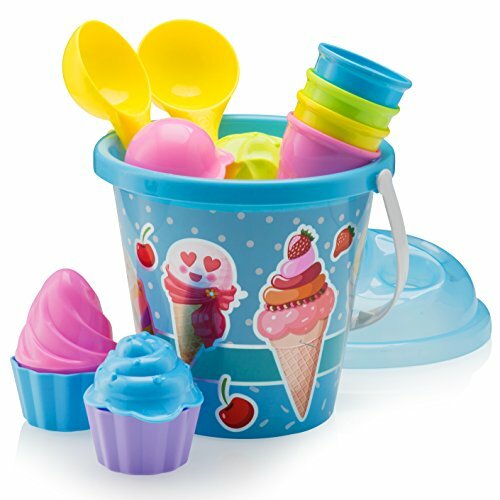 Your little chef will be able to “make” ice cream and cupcakes. It’s perfect for 1-year-olds onward. The set also includes a large bucket with a lid to keep everything in place when not in use. We love that all the pieces are made of high-quality plastic. These frisbees are a great way for you and your children to bond. It’s easy to figure out and even the younger ones can participate. These floatable rings have made the game even better, with an easy to catch design. 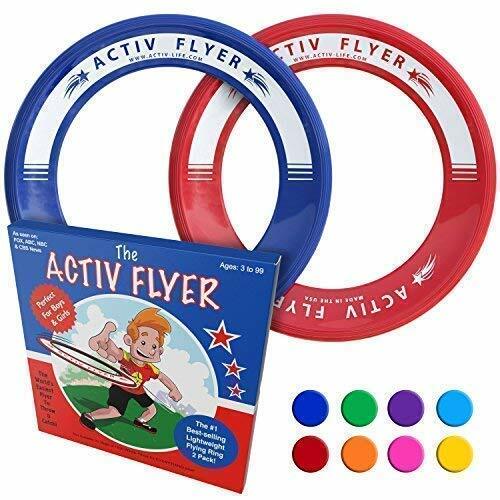 Created to fly straighter than traditional frisbees, these flying rings are excellent for children ages 3 and up. The set comes with two lightweight rings, in a choice of color combinations. With this aquarium, your teen will get to explore the creatures of the sea up close. Simply submerge it in water, and then study the sea creature from all sides and angles. Once the study is over, they can be gently released back into their habitat. 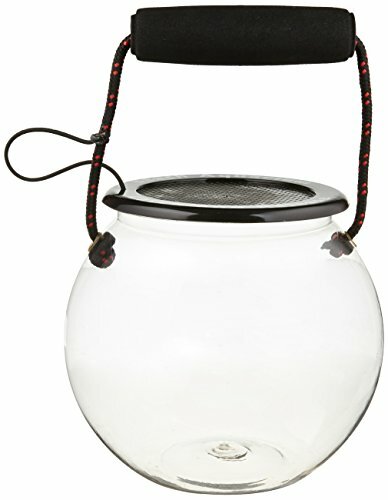 The bowl is made from durable plastic and the screen lid is attached to the handle so you won’t lose it. This is a cool option for teens, or with parental supervision for younger kids. A great opportunity for conversations and engaging learning moments. A sandy beach is a perfect place to play around with 6-inch vehicles. This set includes two heavy-duty machines that resemble the real deal. 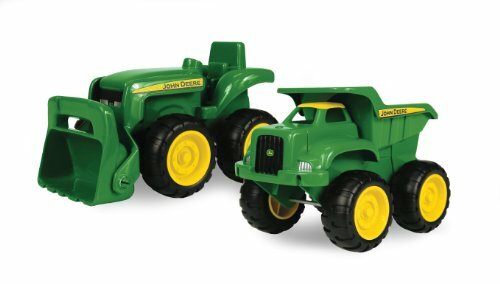 Your toddler will get a dump truck and a tractor, both with functional parts, such as the front loader. The vehicles are made out of hard and durable plastic, so your child can enjoy them for years to come. Suitable from 18 months old. If you’re an athletic family, you might be on the hunt for something everyone can enjoy. A good game of lacrosse could be the perfect beach activity. 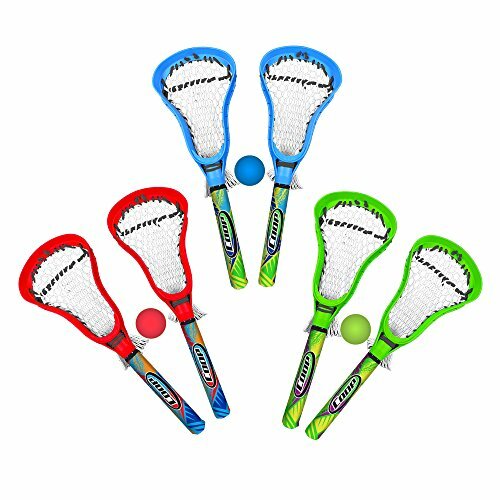 With this set, you will get two brightly-colored lacrosse sticks and one soft ball. 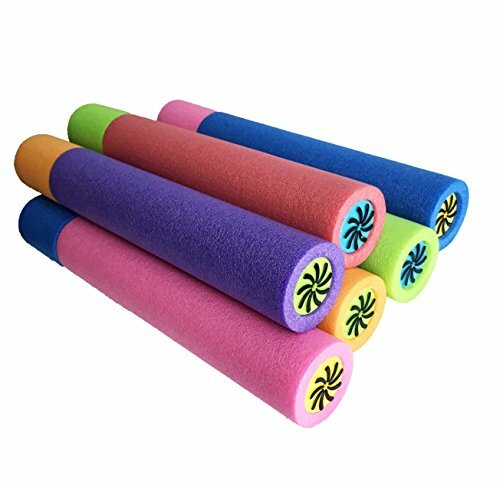 The sticks are comfortable to hold, with their foam handle, making them excellent for children ages 5 and up. Time for a little friendly competition! Going to the beach on a windy day might seem like a hassle. However, this is the perfect time to try out a new kite. These kites look like giant flying octopuses with their long tentacles flowing in the sky. 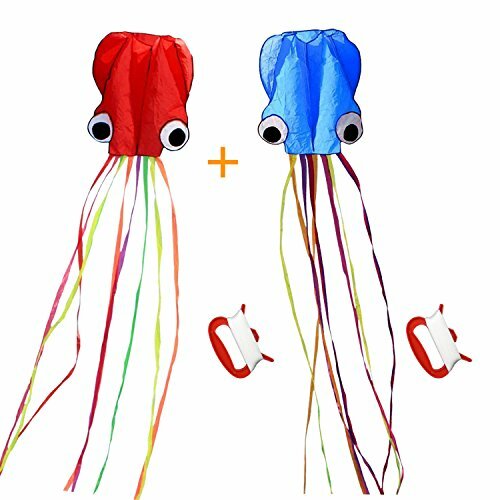 The two kites are easy to fly and suited for children ages 3 and up. If your child is young, you may need to help them get started. They come fully assembled, so all you have to do is unwrap them and you’re ready to go. If your kids are into ball games, they’ll love Spikeball. Imagine a mix of volleyball and four square, although it doesn’t require much space. 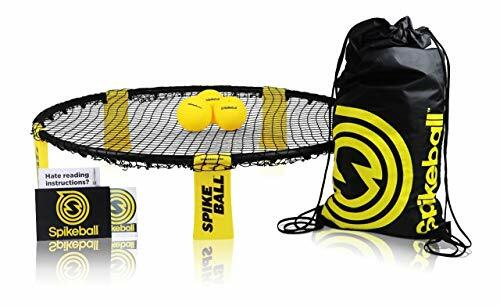 The set includes a net (almost like a trampoline), three balls, and a rule book, for those that take game playing seriously. The legs of the net can be folded for easy storage and the set comes with a carrying bag, which all the materials fit into. It’s best suited for two teams of two players and has a lifetime guarantee. No minimum age is specified by the manufacturer, but we have a feeling the teens and parents will also get involved. Here’s a great one for water fights — these animal squirt guns are awfully cute. 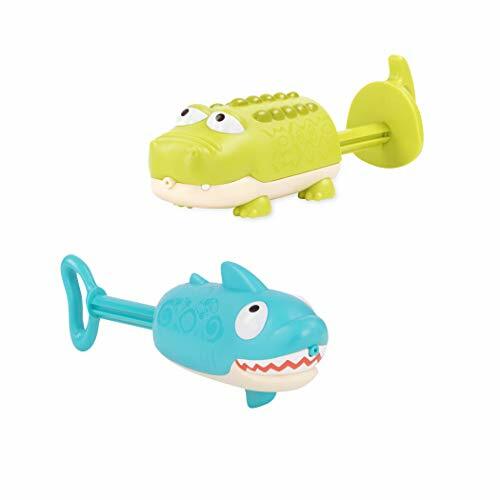 The set includes two 7-inch squirters: a crocodile and a shark. They’re easy to hold and use, and great for children ages 18 months and up. Simply fill them with water by pulling the handle, take your aim and push to shoot. We like that the water squirts are made of non-toxic plastic. These brightly-colored stacking toys are ideal entertainment for even the youngest beachgoers. 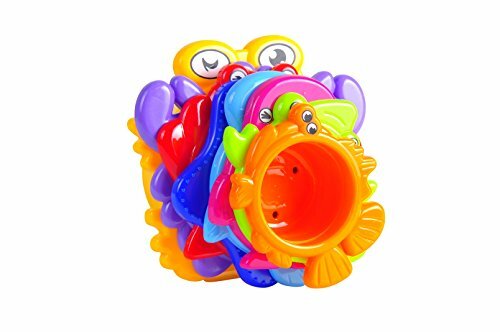 The set includes eight toys that are shaped like different sea animals. They’re made of hard plastic that’s non-toxic and BPA-free. Stacking cups like these will no doubt be used at home as well, for babies and toddlers. The holes prevent water from building up in the toys, and the cups nest neatly together for storage. Children 6 years and up love playing around with water guns on the beach. The guns are easy to use — all you have to do is pull the handle to fill it, then push it to fire. The lightweight foam material makes them floatable, so you won’t lose them in the deep sea. The blasters shoot up to 30 feet. The set includes six colorful water guns — enough for the whole family to get involved. 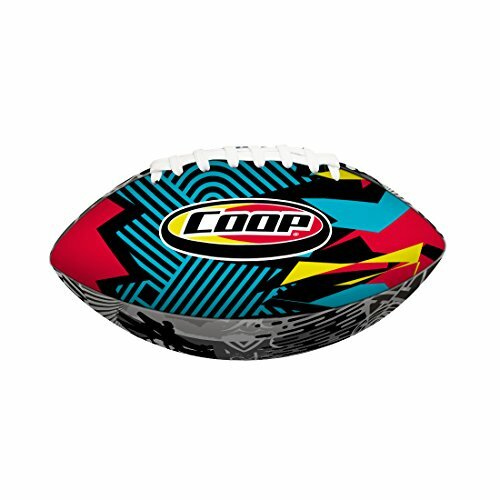 This hydro football is an awesome ball, both in and out of the water. It’s made of durable material with tough stitching, so it’s completely waterproof. The laces are double-tucked to give you a good grip, even in water, and it’s excellent for children ages 5 and up. Its air retention feature is also long lasting, so no need to carry an air pump with you. A strong shovel is essential for treasure hunters, and this one will get the job done. The spade measures 31 inches from top to bottom — a good size for children ages 3 and up. The shaft is made of wood and the spade and handle are sturdy plastic. 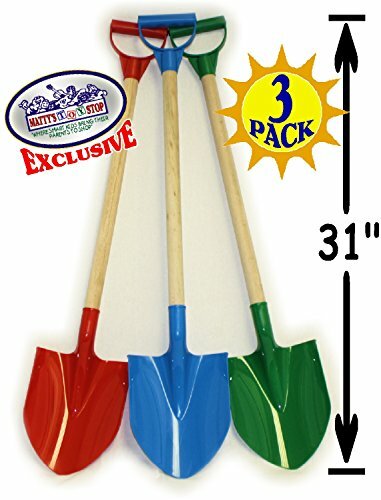 There’s a set of three shovels in this pack, making it a great option for team digging and castle building. The ocean can be a bit intimidating for the baby of the family; it’s sometimes best to introduce them slowly. 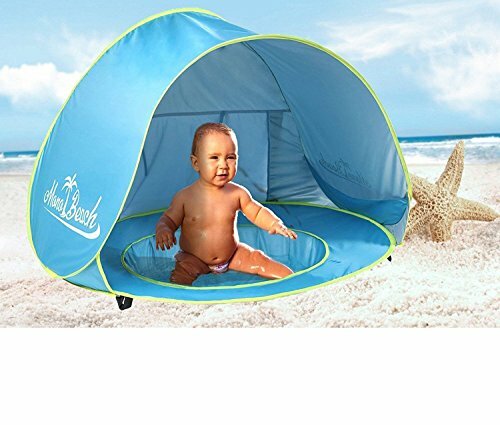 This splash mat/tent allows your baby, 7 months and older, to sit and play on the beach while getting used to the salty water. The mat has a large canopy to protect your baby, with a 50+ UPF rating. To use the mini pool, just dig a small hole and place the tent on top. There’s a storage compartment for small items, two-way zipper, pegs for stability, and instructions included. A carrying bag is also included for your convenience. This multi-layered sifter really puts the fun in funnel — get it? 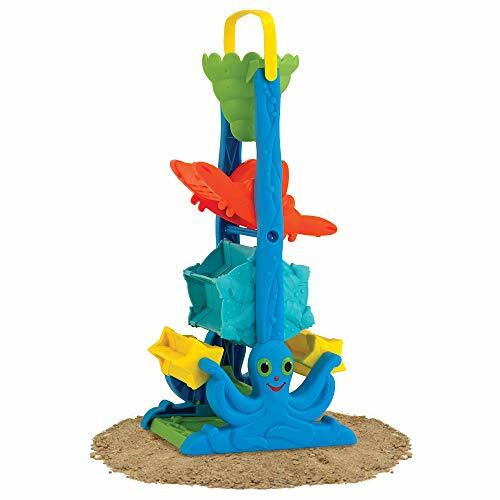 It’s 14.75 inches high and features various creatures that your toddler might find in the sea. There are several brightly-colored layers with a friendly octopus at the base. The handle makes it easy to carry. Watch as your little one figures out how to sift sand and water through the funnel while making it spin. Great for kids 2 years and up. Beach activities vary a lot depending on the age of your child. 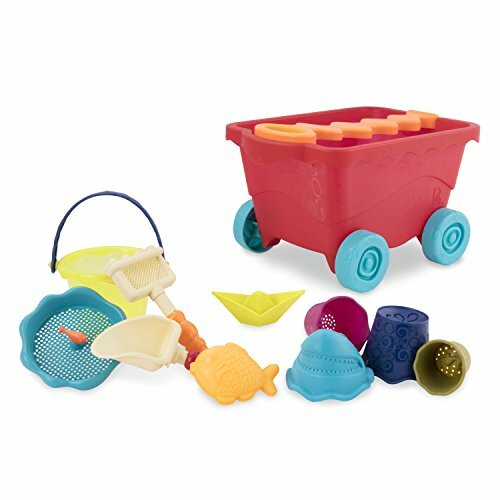 Babies and toddlers might enjoy sand molds, buckets, and shovels. But older children and teens need more entertainment, and likely want games to play, like lacrosse or other ball games. Although all items on our list are great, we have to mention the Mini Ogodisk super disk set again. These trampoline-like disks are fun for the whole family, lightweight, and easy to carry. We appreciate the durability, because we know we’ll need it. Does your family enjoy beach activities? What’s their favorite? Please comment in the section below and share your thoughts.